This 1970s-era Mac's Service Shop story made me think about all the cellphones today being dunked in toilets, swimming pools, lakes, and washing machines. Of course back in Mac's day not everyone was walking around with an electronic device tucked into his or her pocket waiting for its absentminded owner to bend over or drop his/her drawers. At the time, far more wallets made the dive than transistor radios. I won't bother linking to any articles about how to best dry your dunked phone because there are hundreds - nay, thousands - of them out there. They contradict each other about which absorbent materials to use or not use. Nearly identical tests with a wide variety of phones show completely opposite results. Nearly everything is anecdotal, with no truly scientific method applied. One thing most people agree on is that plunging your wet phone into a bowl of rice will only get you a dry outside with sticky rice residue all over it. If the phone manages to work afterward, it likely would have done so without the rice. Note, as mentioned before, that the seasonal setting of the story coincides with the edition's publish date. Summer had finally come with a vengeance. After a hot and humid night, the morning sun blazed from a cloudless sky and was already pushing up the mercury when Barney stepped gratefully into the air conditioned coolness of Mac's Service Shop. "Man, it's going to be another scorcher," he said to his employer busy training a heat lamp and a small fan on an uncased transistorized radio lying on the end of the service bench. "Oh, oh! "he broke off. "I see the dunking season is upon us." "Right on both counts: it is going to be hot and humid, and people have started dropping their radios into oceans, lakes, ponds, rivers, creeks, swimming pools, bilge water, and bathtubs." "I'm always a little astonished at how many of these victims you're able to resuscitate," Barney admitted, "especially since I know what an enemy of electronic components moisture can be." "In the beginning, I was pretty pessimistic myself," Mac said. "It all started years ago when a customer brought in a big console Philco radio with the first remote control system I ever saw. This system used a low-frequency r-f control signal and a complete control receiver, together with thyratrons, a stepping relay, and electric motors to tune the receiver and control the volume. "It had a very impressive chassis, and it was a real mess. The river had come up suddenly in the night while the owner was away from home, and when he waded out to his house an the following day he found the receiver floating speaker-down in three feet of muddy water. He simply loaded it into his trunk and brought it right in here to the shop. "Everything, including the tube-type battery-operated remote control unit that was about the size of a football, was caked with a thin coating of mud. The veneered cabinet was already starting to split and break. I took one look and advised him to forget about it, but he was stubborn. He said he liked the way that radio operated and sounded, and he was not concerned with the looks of the cabinet. He wanted it repaired, no matter what it cost. He was willing to pay me for my time if I would just try to make it work. Money was of no concern at that point." "Must have been a well-heeled bank robber," Barney observed. "No, just a well-heeled bachelor brick layer," Mac answered. "Anyway, I took on the job. "First I washed off all of that mud I could with the garden hose and then wiped off the rest. Then I used a couple of heat lamps and a big fan to dry off the moisture as fast as I could before I started checking. The tubes, of course, were unaffected. I checked out all the paper capacitors and replaced a half dozen or so that showed leakage. "The electrolytics were OK; and resistance checks looked all right; so, with considerable misgiving, I turned it on. It began to play at once. For three days I kept it going continuously with the fan blowing on it; then I shut it off and completely realigned all tuned circuits, including those of the remote control receiver. After it ran for three more days without the least trouble, I gave it back to the owner with a request to let me know how it worked out. I did not see him again for over a year, and then the trouble was simply a burned out tube. The set, he reported, had been working perfectly all the while. And fortunately, there had been no more floods." What About PC Boards? "That was a hand-wired job," Barney pointed out. "I imagine things may be a little different with a printed circuit board where short leakage paths can really foul things up." "That seems reasonable," Mac agreed; 'but, as you yourself pointed out, we've had very good luck reviving transistorized receivers that have even been dropped into salt water - if they have not been in the water too long and if we get them reasonably quickly after their baptism. If the receiver is dropped into salt water, the best thing the owner can do is to rinse it thoroughly in fresh water just as soon as he can. The idea is to wash away, or at least dilute, the corrosive salts before they have time to eat into metal parts and to attach themselves to the circuit board. If these salts are allowed to dry on the board, they can still continue their dirty work because of their hygroscopic nature. They can readily absorb moisture from the atmosphere and continue to cause their chemically corrosive action." 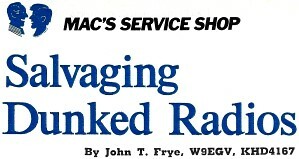 "One thing that helps protect these radios from moisture damage," Barney suggested, "is the coating over the circuit board and the wax impregnation of the coils. Transistors, of course, are hermetically sealed, and electrolytic capacitors that have been sealed to keep the electrolyte moist are also protected against the entry of water. One item, though, that has no protection is the paper cone of the speaker. I notice that quite often you replace the speaker. "That's right. Oddly enough sometimes the cone suffers no warping at all after being soaked, while again it may come out looking like a washboard. This probably has something to do with the nature of the cone material or possibly with the synchronization of the drying action of the different areas. At any rate, I replace the speaker if there is any rattle or distortion in the sound or if the cone is visibly warped. Since the owner is usually convinced his favorite radio - quite often one with a deep sentimental value - is hopelessly ruined, he is very glad to pay for a new speaker. "Incidentally, a final critical check of a dunked radio is a comparison of the measured current drawn by the receiver with the manufacturer's specification. Any appreciable increase in this current indicates leakage that will impair performance, shorten battery life, or both. The current must be brought down to normal before the receiver is returned to the owner." "Summer vacation time is pretty hard on electronic equipment that is not dropped into the drink," Barney observed. 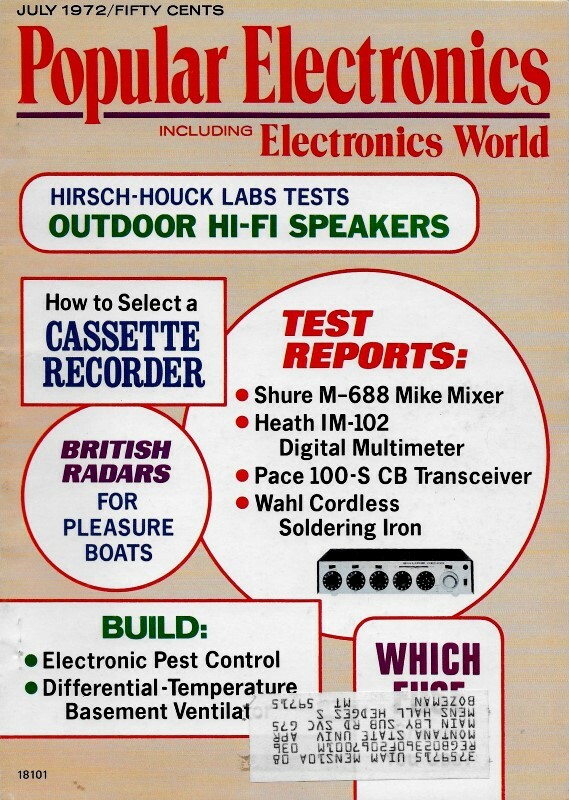 "Radios and tape recorders are left in the boat, on the dock, or by the swimming pool all night. A thundershower soaks a portable TV or hi-fi left on the screened-in porch. Night-flying bugs and even mice crawl into portable TV sets operated out-of-doors or in cottages and are electrocuted." "Yes," Mac agreed, "and while most people have learned you shouldn't leave your loaded camera on the back ledge of a shut-up car on a hat summer day, they still leave their radios and tape recorders there. Sun shining on such an item through the rear window can raise the temperature inside the case to 140 degrees or higher - hot enough to melt the wax of capacitors, dry out the electrolytics, and shorten the battery life. The radio or recorder is much better off under the seat where it is safe from both the sun and the eyes of a possible thief." "Hey!" Barney interrupted, "when our basement was flooded by a cloudburst a couple of years ago, the gas company men came out and shot carbon tetrachloride into the various furnace controls to take the moisture out of them. Why don't we use carbon tet[rachloride] to dry out radios?" "For the same reason we don't use it as a degreaser," Mac answered promptly. "It is too dangerous to use except under carefully controlled conditions by carefully trained technicians. However, there are several aerosol chemical products on the market, such as General Cement's Dri-Spray and their Formula 70 Moisture Remover that will do the same job safely. You'll find both up there in the cabinet." Effects of Air Conditioners. "I'd think the widespread use of air conditioning would make things a lot easier on electronic equipment in the home during the summer time," Barney remarked. "Not only does it keep the temperature down, it also takes the harmful moisture out of the air." "The set was ordinarily used in the living room right next to a window air conditioner. The owner noticed the cabinet became quite warm during operation - it was a tube type receiver - so he was accustomed to pulling the receiver away from the wall and directing the cold air stream from the window unit directly into the back of the cabinet. This kept the chassis cool all right, but it ,also kept it yo-yoing up and down through the condensation point as both the receiver and the air conditioner went on and off. Moisture condensed on the metal chassis and the metallic leads of the printed circuit boards. High voltage arced across various points and either burned out components directly or formed carbon paths that did the job more slowly. I suggested he discontinue his practice of 'cooling it,' and that was the end of the summer complaint with that set." "Just goes to show you can get too much of even a good thing," Barney said. "But it's still a good idea to protect electronic equipment from heat and humidity. The two in combination are particularly harmful. That's why it is murder to install such equipment in a warm, moist basement. Many a ham has learned to his sorrow that a snug basement ham shack is not a good idea at all unless the humidity can be carefully measured and controlled continuously. Persistent moisture is especially rough on high-voltage transformers. I had one ham friend who blew three of these before he finally got the message and moved upstairs." "I know, I know," Mac said. "That is one of the chief reasons I put air conditioning in here. Before I did, I was having a lot more trouble keeping the instruments in calibration and in good operating condition during the summer season." "Did you have to go and say that?" Barney asked plaintively. "Here all this time I thought you put the air conditioning in to provide for Matilda's and my comfort! Can't you leave a guy a single illusion? I certainly hate to realize I've been playing second fiddle to a VTVM!"